Service Costs > How Much Does Google Fiber Cost? Google Fiber offers internet and television at speeds that are advertised to be 100 times faster than other services. Aside from offering Internet speeds up to 1,000 Mbps, their cable selection offers up to 220+ channels, with HD channels included. The cost of Google Fiber will depend on your location and the type of services you need. On average, Google Fiber can range anywhere from $0 to as much as $135+ per month. For instance, the free Internet plan is $0 with a one-time $300 construct fee, but this plan seems to be disappearing in some areas Google is currently servicing. On the other hand, the Internet, plus television package, is $120 per month in Kansas City. If you just want the high-speed Internet package and nothing else, the cost would be $70 per month. When packaged with television, the costs can be about $120 per month for access to 150+ channels to budget properly. Keep in mind these prices aren’t set in stone as they can raise the prices just like other service providers. For instance, in some cities, customers are paying $10 more per month than original customers were. For example, in Provo, Utah, the plans range anywhere from $0 for the free Internet to $120 for television and Internet services. According to Money Magazine, the basic free Internet plan is $25 per month for 12 months or for a $300 one-time fee. The television package includes more than 150 channels in HD, including popular channels like ESPN, CNN, Food Network and more. To see what channels are available in your area, you can view them here. The Internet through Google Fiber is hundred times faster than ordinary providers. Upload and download speeds are measured up to 1,000 Mbps, according to the official website. Television and Internet plans will require a two-year commitment, while the stand-alone Internet plans will require a one-year commitment. Just like any other cable television provider, adding premium movie channels can increase the cost. For instance, adding any movie channel can be an additional $10 per month; however, if you choose the movie premium package, it will include every movie channel for $40 per month. The Sports Plus package, for example, retails for an additional $10 per month. Applicable taxes and fees may be charged. Additional TV boxes will either cost $5 per month or a one-time $120 fee. If you take advantage of the free Internet, a construction fee may apply depending on the city. Fiber Phone, Google’s home service, is available for an additional $10 per month. This service offers unlimited nationwide calling, spam filtering, call screening and a do-not-disturb setting. The television service cannot be purchased on its own. You will also have to pay the monthly internet fee. 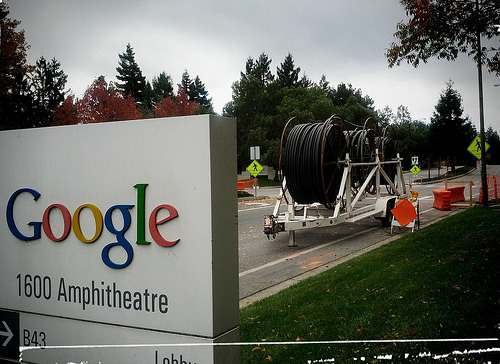 Google Fiber is extremely limited to a handful of cities. While they continue to expand, be sure to sign up for its alerts if you are interested in signing up for the services. You can input your email address to stay current on the expansions. You can also stay up to date by visiting Google’s official map. Free Internet is guaranteed for up to seven years at an address. There are no data caps on the services. If you are not an avid Internet user, the free Internet package should be more than enough. For instance, in Kansas City, if you cannot pay the full $300 up front, Google will let you pay $25 per month for first 12 months of service instead. If you are thinking about switching your television provider, be sure to compare a few other services in your area to see how prices compare. While it may seem like the best deal, in some cases, a competitor could offer better prices. Signing up for a monthly plan will waive the construct fee. I hate the monopoly that the cable companies offering broadband have over communities. Direct Tv keeps going up.